"The subject of this work is the daughter of the Doncasters who wre friends with Drury. He used each of the daughters as the inspiration for one of his works. 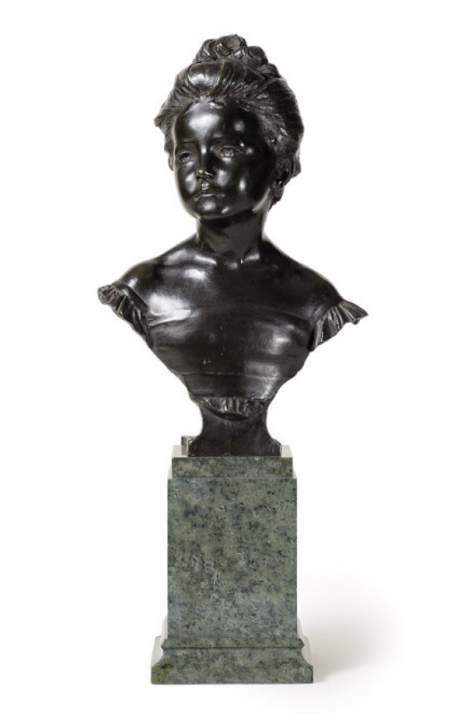 Clarrie was the model for the scuptures of Morning and Evening in the city square Leeds, Gracie was the model for the bust known as The Age of Innocence, but for this, his most charming work, he gave no allegorical title, just a simple portrait title" (Bowman, 22). Beattie, Susan. The New Sculpture. New Haven: Yale University Press, 1983. Pp. 107-21, 167-74, 242, 260. Bowman, Robert. Sir Alfred Gilbert and the New Sculpture. London: The Fine Art Society, 2008. Pp. 17-20.